1190 members have added this recipe to their cookbook. My son even loved it! Great tasting, easy and quick. I made this last night for dinner. The salmon was excellent, but the asparagus was a bit too mushy. I think next time I will just steam the asparagus so it has a bit more crunch to it. I like this very much. I mixed all the seasonings and marinated the salmon in it for about half an hour before cooking. Love this! I think the thing I appreciated the most was it was quick and easy to prepare, but still tasted DELICIOUS! After a long day of running errands this was the perfect meal. My boyfriend and I both loved it! Though, I did omit the wine from the salmon and opted to drink it (and a little extra!) instead. I'm currently trying to limit my alcohol intake, it's hard for me to pass up an opportunity for a glass of wine! ;) Also, as others stated, at 350 degrees my salmon fillet took much longer than 7-10 minutes to cook (asparagus was done cooking well before the salmon, but it was mostly my fault for not thinking of that), but that may have partially been due to the large size of fish I bought (I wanted leftovers!). Thanks for sharing the recipe! Couldn't find boneless, so I made it with Salmon bone in steak, but it was INCREDIBLE! It had such a great flavor and the boyfriend loved it too (a major plus). This will another regular meal in our collection. Very good. I added some shaved parmesan cheese to the asparagus, toasts and adds crispy texture and flavor. 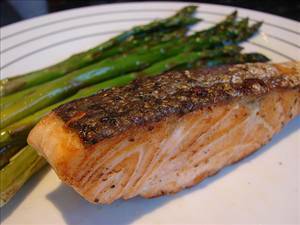 Used some large asparagus, appropriate so it can survive the broiling along side the salmon. The Salmon was skin on filet, so so there was a larger surface for the seasoning to be applied. Used 375 deg convection bake. Yummy. This was great! I love asparagus so it is nice to have another way to cook it. My oven took longer to cook than the 7-10 minutes but I had it set at 350, next time I will go straight to 375. Calorie break-down: 50% fat, 12% carbs, 38% protein.